One of the major selling points of our new abode was the finished basement. Terrazzo floor, fully paneled walls and a drop ceiling. And large open spaces. 13' x 40' for the layout. One can do a lot of damage in that kind of space. But of course, it's not "perfect". The ceiling tiles are almost 50 years old and showing their age. Pool cues and kids with darts hadn't been kind to the tiles. The lighting fixtures were a good 30 years old as well. T 12 florescent tubes, which are juice hogs compared to today's T 8 fixtures. So changes are in order. All the tiles have been removed and the fixtures replaced. It turns out a good move on my part. The fixtures were connected to ceiling boxes with short runs of BX wire. Nothing wrong with that, except the wire inside the BX was aluminum. Aluminum and copper are not supposed to be used together except with special connectors. Fires can result. And I found a couple of scorch marks as I rewired the fixtures. Removing the tiles turned out to be far more of a job than I had hoped. The ceiling had been professionally installed when the house was built in 1968. And the installer certainly rose to the occasion. Common practice is to have the T-bars 3" below the lowest obstruction. In my house they didn't even leave 1/2" in some places. Which left me cursing heavily as I tried to remove the tiles and wondering how they installed the tiles in the first place. The answer came to me as I got near the north end of the room. They hung all the primary T-Bars and then added the connectors as they went along with the tiles. It's the only way. So I've had to remove most of the connectors in preparation for replacing the tiles. It was a filthy, nasty job but it's done. Once my back stops spasming I will start in on the new tiles and then we can focus on trains! He discusses dealing with shorts and his DCC system. His issues are not unlike some of the issues I had on the old layout . Have a read. It'll give you something to think about. The pilot models are done! Assembled, painted, decaled, and a touch of weathering. 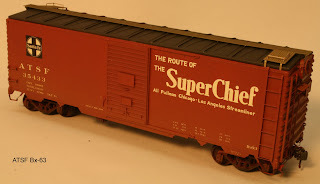 First, the ATSF 12 panel 40' boxcar. This set of kits is dedicated to the memory of Richard Hendrickson, the grand man of prototype modeling. A better resource for freight car history just doesn't exist and a really nice guy. Richard was very helpful in the creation of this kit. He shared many photos and a great car history which is included in the kit. These kits will retail for $60.00 ea. They include specially designed etched parts, all new etched ladder and rungs and a custom set of Speedwitch Media decals which include all the slogans for both the "map" and "Ship and Travel" and Kato ASF A-3 trucks. 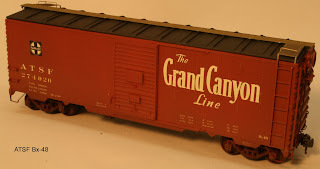 The Northern Pacific 1937 AAR boxcar. We did this kit as a compliment to the stunning decal set offered by Speedwitch Media and because our pattern maker models NP. This kit has the distinctive lower door track, custom 15" rung center ladders, additional etchings and laser cut R/Bs and the Speedwitch decal set. as well as a set of Tahoe Model Works trucks. The models will be officially released for sale at the St Louis RPM, Aug 6 & 8 2015. After that date they will be available for sale on the website and at the Naperville RPM in Oct. Nothing like working to a deadline. The St Louis RPM is in 2 1/2 weeks and I want to have 4 new kits ready in time for the show. Just now I finally finished assembling the pilot models and they are in the spray booth drying. 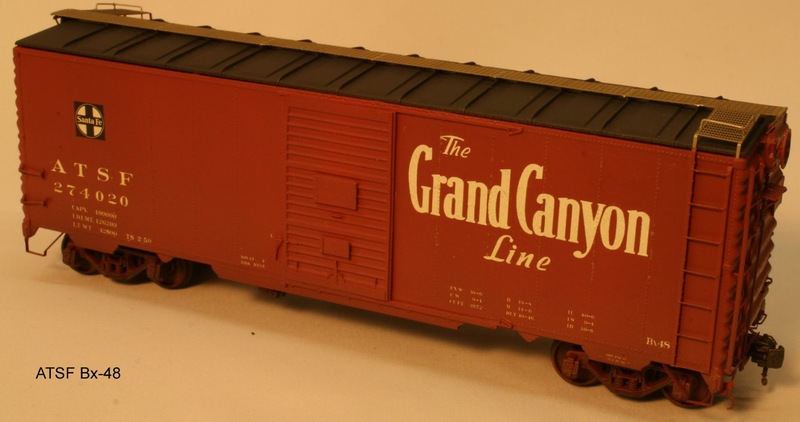 First is the Northern Pacific 1937 AAR boxcar. This car was done by us for a few of reasons. The lower door track was in a unique position compared to the "stock" AAR cars and I wanted to reflect that in a model. Also Speedwitch Media offers a beautiful decal set for this car and I wanted a model as good as the decals to show them off. Lastly Aaron had shown me this body pattern a little while ago and I felt his efforts warranted showing off. Proper 15" rung center ladders have been created for this model and 15" wide end ladders are provided for as well, along with all the usual etched details you've come to expect from Yarmouth Model Works. The other kits are the ATSF 12 panel riveted boxcars. Other than a plastic model with cast on details this car has not been offered up in kit form before. The production run will actually consist of 3 kits covering off the variations in the production runs. Speedwitch Media created a special set of decals for us for this kit which will cover off all the variations and slogans that were applied to these cars before the application of the "giant herald" in 1959. Custom ladders and other etched details have been created to help create a real stand out model. I fully expect to have kits for sale in St Louis now that the pilot models are done. Now to sit down and write the instructions. A new Prototype to Model? Now I can model the old L&PS line in front of my house with RTR equipment. Wonder if anyone makes a DCC sound decoder for that locomotive. Just got these from the etcher. Left hand side ladders for Rock Island boxcars. At the request of a couple of people who participate in the annual Cocoa Beach Shake and Take kitbash project, I had these ladder stiles created. They'll be up on the website in a couple of days for ordering. They are $3.00 USD per fret. A fret will do 4 cars. You can send payment through Paypal, use my email address or email me with your order and I'll invoice you through Paypal. These guys are quietly waiting for my friend Trevor to visit next week so they can take up residence in their proper home. The first 2 are Smokey Mountain Model Works gondolas. Some very nice kits that were a pleasure to build. I always enjoy creating the interior wood look. The technique is a variation of the method described in the Tichy flat car instructions. I start with a coat of Foundation, any tan, beige wood colour will do. Let that cure for a few days and then I come in with oils and streak in a couple different brown colours and add lots of black ink wash. The technique can be altered to represent treated or non-treated timbers very easily. And a pair of Ridgehill Scale Models CPR Fowlers. As a modeler of a Canadian road in the '50s, Trevor can never have too many Fowlers. The running boards have not been added because Trevor likes to add his own real wood running boards. Handsome models, even if I do say so myself. 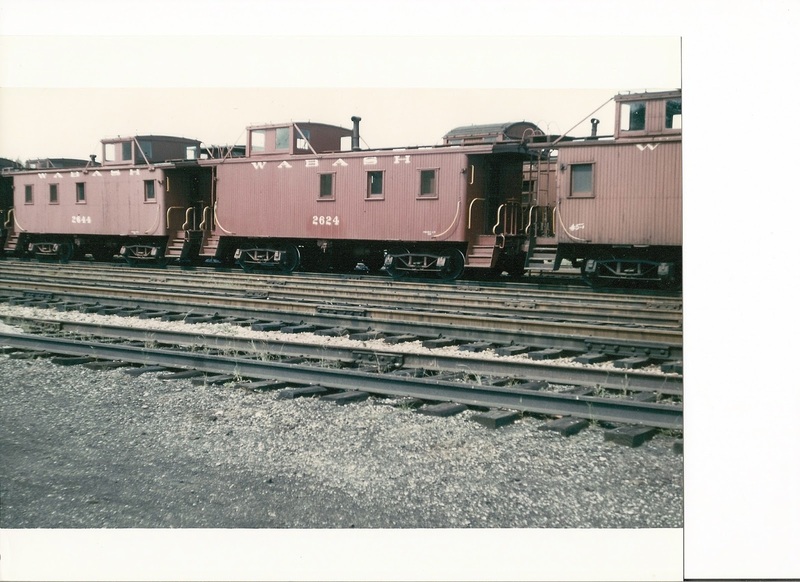 So you think you have enough cabooses, do you? I now know that I don't. Yesterday I spent a couple of hours with my friend Wes Dengate. A London based retired teacher, whose father was an engineer working out of London back in the steam days. In his youth Wes worked as a brakeman in the summers in St Thomas and his father ran some trains out of St Thomas as well. Wes is also a railroad buff and an active historian. His collection of photos and data is remarkable. Wes wrote the articles on the Wabash in Ontario for the Wabash Historical Society that inspired me to model the operation in the first place. 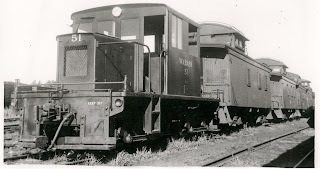 Among the things he shared with me was a list of the number of cabooses assigned to the Buffalo Division of the Wabash. That bit that ran in Ontario. There were 38 Wabash cabooses in Ontario. 30 of which were in pool service. As well as other assignments. All of this tells me that I don't have enough cabooses. With the planning for the new layout focusing on the St Thomas yard and the crew and caboose swaps, it's clear that I'll be building many more cabooses soon. I've got 8 right now. And I'm thinking that I'll be needing at least 12 more. I've also realized that the line was far busier than I had first thought, in the time frame that I'm modeling, (1951). The potential is there for 30 trains a day. That's a train every 48 minutes on average. May not sound like much, but consider that in the mix is a daily mixed train and way freights that need to ply their trade. It also means that I have to rethink the staging yards. They may need to be a little bigger, and be setup to allow for quick restaging. Keep that freight moving! And it's not near as exciting as one may have hoped. I went over to the yard this morning, hoping to talk to someone on the maintenance crew who could enlighten me as to the reason for exposing part of the roundhouse floor. There I encountered a fellow, who's a yard sale buddy of my wife's, who works there and is a bit of a history buff. He told me that they had been given a front end loader to train on and he used that as an excuse to some minor amateur archaeology. Additionally they went into the "backside" of the yard and exposed some old pilings that supported a loading dock of some sort. I have to double check against the survey I have but I think it's an old stores building. Not terribly exciting but certainly interesting to people like me. A couple of days for decal application and these guys are done. All they are waiting for is trucks and airhoses, but that'll take 1/2 an hour. The trucks are sitting in Port Huron, waiting for me to go and get them. Between waiting for etchings for the new kits and the foot surgery, traveling to Port Huron has not been an option. I'm very pleased with how these cars have turned out. That whole SFRD paint scheme is a real eye catcher. It took a little time to get the orange right. The initial mix of 2 parts reefer yellow and one part reefer orange was way to orange. It's about 6-1 yellow to orange I think, using Scalecoat. And if I do another batch of these I'll vary the tone a little. And many thanks to Ted Culotta who helped me out with the maps and slogans for 2 of the cars. So how many can I do for you? Yesterday I had a visitor up from Ohio. It's always great to see Bob. Usually we only meet up at the RPM in Naperville, but Bob felt the need to drop off the grid for a couple of days so he came to visit. His first time in to St Thomas. So he got the nickel tour of all the railroad related sites in town. The old Pere Marquette facilities. The CASO station and shops. The Wabash yard and shops. and the CPR interchange in the east end of town. It was while I was showing him the footings of the Wabash roundhouse door posts that we came across this. For some reason, they have scrapped off the soil that was covering this part of the old roundhouse floor. Now I have yet another small mystery to solve. Whatever are they doing exposing this old floor? I can't conceive of a single good reason for this. Fortunately we know a fellow who works for CNR who may be able to shed light on this. Now if he'd only answer his phone. The way that reefers evolve as they get finished. It's fussy, fidgety work, that really rewards the efforts. With multi-colour cars like this I add as much detail as I can on the flat cast sides and then paint the components before assembling the box. It saves me a lot of masking and the parts usually separate at the colour separation lines. The cars really start to pop when the hardware gets painted. There's something about reefer door hinges. With these cars I also did something I've not yet done before. Open ice hatches. At the clients request all the hatches are open and resting upon the hardware. I like the look. I also took care to paint the actual plugs to represent canvas as I believe that canvas was used on the plugs. Well the stitches are out of my toe. The doctor and I are both very pleased with progress. And I'm mobile again. Yippee! I have been working some, but the elevated foot requirements have restricted my time at the bench. But today following my return from the podiatrist real progress was seen in the shop. One classic resin kit. A Steam Shack CV end door autocar. How old is this kit? I'm pretty sure that it was one of the very first resin kits I ever built when it first came out decades ago. I was inspired by a product review in RMC, to acquire and build 2 of them. Who knew where it would lead to? Beside the CV car are 2 Sunshine NYC Express Reefers. A pair of really nicely designed kits that reward the modeler with a very striking car when done. Those 3 are just drying after getting the decals applied on the second side. 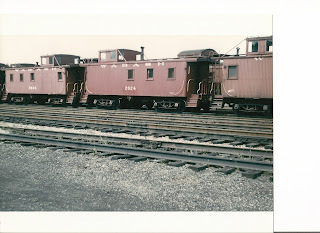 And in front are 3 Sunshine SFRD Rr-5-9, 11 ice reefers. They are now ready for detail painting and the application of the hatches. All the hatches will be open as per the clients request, so the first thing tomorrow is to paint the canvas plug covers on the hatches themselves, along with picking out in black all the hardware on the car sides. Even though multi-colour reefers are extra work, I enjoy them. They are always pleasant to look at and reward the extra effort with their appeal. Oh and lurking in the very back are the test castings for 2 new kits. So things are happening in that department as well. One of the perils of having time on one's hands is the potential for thinking about one's options. In my case, the wait for starting a new layout, in part imposed by bunion surgery, allows me to consider further options for what I want to recreate. The last plan I thought about was limited to only 2 towns and lots of main line in between. Certainly an achievable layout and allows me to present the things I want to present and model. But something was lacking. The Ontario Wabash operation was rather unique in Canada and I really want to showcase the Red Balls more than the 2 town option would have. And Steve Lucas' commentary on options got me thinking. Why not include St Thomas? It's a modest yard. It's principle operational function was to serve as a crew change point and an originating point for locals and mixed trains. And running perpendicularly through it was the London and Port Stanley interurban line. I'm fortunate in that I have a friend in London who will be able to tell me which tracks were used for which purpose. Such as which one is the caboose track. Where was the combine stored when not in use, etc. 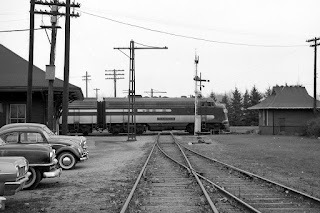 In the era I model, 1951, through trains would stop in St Thomas and have the crews changed, which entailed a caboose swap, while motive power would not be swapped. The actual mechanics of the caboose swaps is interesting, as the process was greatly different for the east bound vs the west bound trains. The west bound trains would stop about 1/2 a mile east of the station, once they were clear of the CPR diamond. The power would cut-off and run into the yard and there the crews would swap and the power would run back and re-connect to it's train. While this was going on, Tilly, the little 42 tonner, would hustle a caboose out for the new conductor. The east bounds were rather different. With the motive power stopped in front of the station, the train would reach back west over the steel trestle over the Kettle Creek and likely foul the crossing at St George St. A little further west of St George St was the caboose pocket. A short little siding just long enough for a caboose and a small locomotive. Tilly would have to grab the required caboose and hustle out westward in advance of the arrival of an east bound Red Ball. Perform the caboose swap and return to the yard once the Red Ball had departed. All of which would make for interesting operations. So I'm strongly inclined right now to include St Thomas in the new layout. The wye will not be part of it. And possibly the roundhouse may be faked, as it's not integral to what I'm trying to present. We shall see how much space this all requires before the big choices are made. But I will be able to create scenes like this. Makes one wonder why not?